Flipboard magazines have arrived on the Web. You can now publicly share with the entire online world any content you’ve turned into a digital magazine, even if the reader doesn’t have a Flipboard account. The new feature is a continuation of the popular reading app’s revamp that began in March when Flipboard 2.0 first introduced user-curated magazines to the service. What the heck is a Flipboard magazine? Flipboard magazines are exactly what they sound like. Users organize articles based on a theme such as surfing, sharks, Sherlock Holmes, or immigration reform into a single collection. Articles are added individually from around the Web using an applet installed in your browser’s toolbar, or from articles found using Flipboard’s mobile apps. Anyone who creates a magazine is called its curator in Flipboard parlance and can add other contributors to their publication. You need a Flipboard account to start creating magazines. Once you’re ready to share your magazine with the world and send it to someone via email, Twitter, or Facebook, Flipboard creates a public weblink for the magazine that you can share with anyone. On the Web, Flipboard magazines emulate the experience you’re used to seeing on your smartphone and tablet. The magazine starts with a large, typically beautiful photograph, and a few headlines automatically generated from articles within the collection. Flipboard also includes a “Get the app” link on the cover of Web-based magazines to make it easier for non-Flipboard users to download the app to their mobile devices. Flipboard’s Web magazines do a great job of emulating the experience you’re used to on touch devices without making it awkward to navigate the magazine with a keyboard and mouse. To flip pages, use your mouse to click on the directional arrows on the screen. You can also navigate with the right and left arrow keys or tap the space bar to advance one page at a time. If you don’t like Flipboard’s page-flip animation, tap ‘Shift-arrow key’ to advance more quickly through the magazine’s pages without the animation. Flipboard says you can also jump ahead to specific pages by tapping numbers 1-9 on your keyboard, but in my tests using Chrome for the desktop on Windows 8, this feature didn’t work. User profiles on the Web show you all their public magazines. Once you’re inside a Flipboard magazine on the Web, you can easily peruse more user-created publications by tapping on the menu icon in the top left corner of every page inside the magazine. If you like the curator of the magazine you’re reading, you can also click on their profile picture to see more magazines by that user. Flipboard’s magazines for the Web are clearly a play to bring more readers onboard to the popular news reading app. But the new feature is also a great tool for anyone looking to share information about a topic they are particularly passionate about. 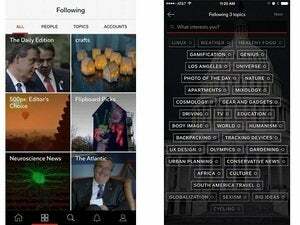 Check out the latest user-curated magazines on Flipboard’s community page.